30 Words or Less: Portraying a dark, violent Halloween night from sunset until the church bell chimes midnight, Dark Harvest is small-town-American horror dripping with strong evocative prose. The Good: Fantastic, almost lyrical prose full of rich detail and unexpected but suitable metaphors; Narrative voice is perfect for the tone and content of the story; Story is a twisted riff on the realities of small-town America. In the 20 years or so that make up my reading career, I haven’t sampled much horror. After finishing Norman Partridge’s Dark Harvest: I have to ask myself: “Why the hell not?” It's simply not a book I would normally pick up. The sub-200 page book concerns an annual tradition in Anytown, U.S.A. in which the local teenage boys attempt to stop a possessed pumpkin creature from reaching the bell tower in the local church before the stroke of midnight. Stop him and you earn your freedom from the drudgery of small town America. But the contest isn’t without risk: the October Boy is born with a blade in his hand and revenge in his heart. At a basic level it sounds like a bad horror movie you might end up watching on some third rate cable channel. A possessed Jack-O-Lantern wielding the knife used to carve his face? Really…? As I said, not my typical read. But horror author and interview subject Joe Schreiber spoke highly of the book. It was short and it was different, so I figured why not? After reading about three or four pages, I was hooked. Partridge’s prose is some of the best I have ever read. It’s fast paced and somewhat abstract but it works. The simple opening sequence of a mysterious stranger cutting the October Boy loose and bringing him to life is utterly captivating. I wish I had more technical expertise to describe what exactly Partridge does but it really reads like it was spoken out loud. And it should be. (I would pay good money to hear Neil Gaiman read this story to me.) The simple yet evocative prose coupled with a strange blend of 2nd and 3rd person narration makes it feel like you are hearing some dark legend whispered over stale beer in dirty glasses in the back corner of some poorly lit no-name bar. Something that happened to a friend of a friend of a friend. You aren’t reading the story, you’re part of it. 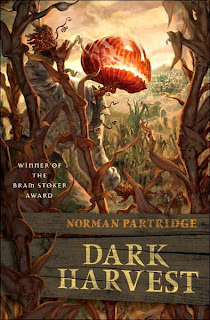 With his hybrid narration, Partridge assures the reader that they know this town, they lived there, they hunted Ol’ Sawtooth Jack, and they even won the contest years before. As you (and Pete) slowly learn more about the origins of the October Boy and the town’s sinister secrets, Dark Harvest gets darker. Under a fairly simple presence lurks a much more robust story, one I wasn’t expecting when I opened the cover. It’s not that the new direction is bad (quite the opposite) it’s that I was enjoying the straight forward story of predator versus predator so much that I would have liked to spend more time with it before it moved into second gear. The first encounter that the October Boy has with a group of over zealous teenagers is so strong that I wanted to see the October Boy make his way through obstacle after obstacle. To continue the food analogies, the main course may be delicious but I’m still going to be a little pissed when you take away my appetizer before I’m done with it. I don’t know if its necessarily a fault of the novel but the change in tempo did jolt me out of the story for a few pages before I got used to the new rules and the prose sucked me back in. Soon enough you find yourself watching all the players converging on the town church with only minutes to spare. By the end of the relatively short book, I was extremely satisfied. While the prose was worth reading and rereading, the story continues to move forward aggressively without become lost. I can't name another book that had such strong prose and moved at such a tremendous pace. Dark Harvest is ultimately a blend of many thematic elements ranging from teen angst and pulp horror to small-town monotony and revenge fantasy. Partridge does a fantastic job mixing these elements together into a dark but extremely satisfying tale. Apart from a brief hiccup which was most likely the fault of my expectations rather than Partridge’s weakness, I highly recommend Dark Harvest. Although you might want to wait until next October, you won’t look at a pumpkin or a piece of candy the same way again.